Turkey is on the verge of transitioning its energy system, and today’s investment choices will determine tomorrow’s energy landscape. Turkey’s urgent policy priority is to reduce its current account deficit that is largely impacted by growing energy imports. Energy efficiency and local renewable energy resources have paramount importance in eliminating the dependency on imported gas and coal. 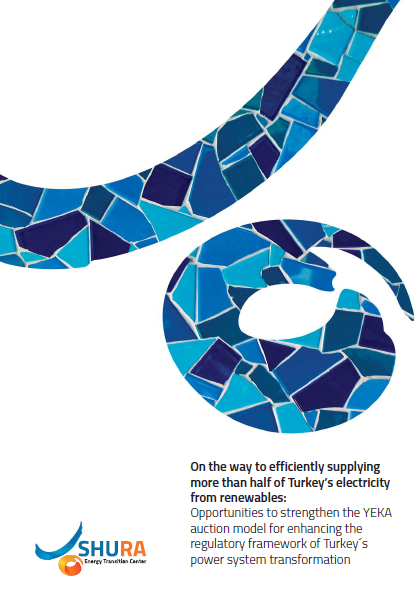 To accelerate the adoption of local renewable energy resources, Turkey has implemented a mix of policy mechanisms. Most recently, in 2017, “Renewable Energy Resource Areas” (Yenilenebilir Enerji Kaynak Alanı, YEKA) auctions were introduced. YEKA auctions resemble the well-known market-based “auction” policy mechanism that is being increasingly implemented worldwide. YEKA auction model is preceded and currently complemented by a portfolio of other policy mechanisms to accelerate renewable energy investments in Turkey. These policy mechanisms are the feed-in tariff mechanism and pre-licence auction model that have been used since 2005 and 2011, respectively. This paper, prepared in close collaboration with Turkey’s energy sector stakeholders, investigates in which areas and how YEKA auction design can be further developed. A trilateral approach was used for this purpose: (i) a comprehensive literature review was carried out to identify policy mechanisms for wind and solar PV installations in Turkey and a methodology to assess the performance of YEKA auctions; (ii) the gaps in Turkey’s auction design elements were identified through a comparison of corresponding experiences in 29 other countries, based on a methodology that was developed for the European Commission; and (iii) stakeholder views and recommendations were collected through a survey based on assessment of individual components of YEKA auctions. This third step also involved the discussion of a preliminary draft of this report during the stakeholder consultation.